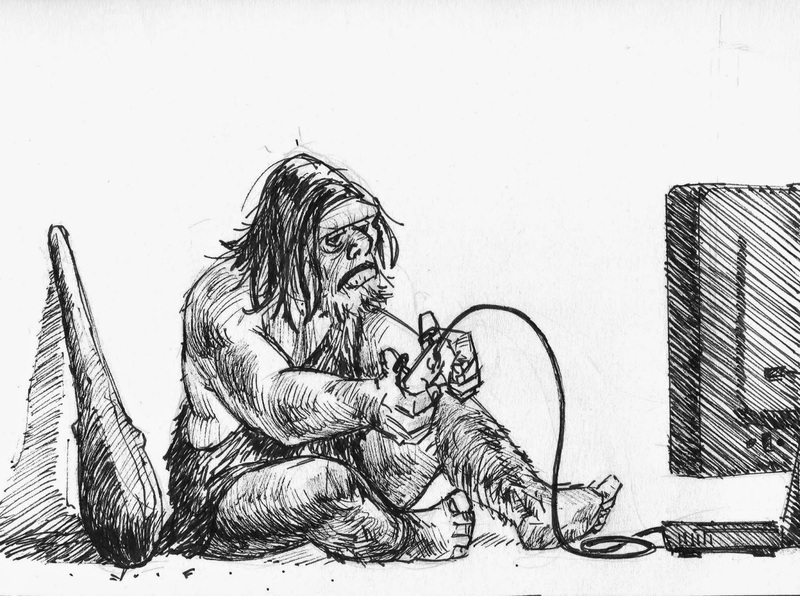 OK, I'm NOT making any comment about video game players being cave men. This is from an idea I've got rolling around in my head. With luck (and no small amount of effort) I'd like to turn the idea into more - an ongoing story, but for now, well... this is it. The pose turned out well. Like the dragon in the previous post, the shaded contour lines really helped define the form and suggest some lighting. It looks good around his body and arms and the near leg, but I kind of messed up around his right shin and other leg - the shaggy body hair helped cover up what didn't look so good. The hands are ok but need to be blockier, to look heavier with squarish cross sections. If I could I would have erased the inked hands and taken another kick at it. I spent a while trying to get the video game controller looking right but it still doesn't. It occurred to me how little I've really looked at one! I'd say the style here was inspired by Will Eisner's - his drawing style and character design and shading and sometimes wonderful messiness.